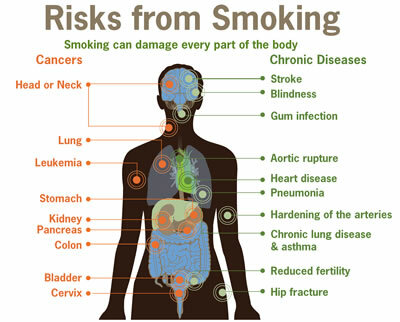 The effect of smoking on a person depends upon the amount he smokes and also on how frequently he smokes. It is said that with each cigarette smoked, a smoker’s life is shortened by an average of 11 minutes. Cigarettes are made of tobacco, which among many other chemicals, contains nicotine as its primary ingredient. Essentially, nicotine is the substance that causes addiction in a smoker. A smoker needs certain amount of nicotine to feel normal, relaxed, or to control his mood through the day. The amount of nicotine he needs is directly proportional to the amount of cigarettes that he smokes in a day. Based on this fact, smokers are classified into two types: Heavy smokers (those who smoke 20 or more than 20 cigarettes a day), and Light smokers (those who smoke less than 20 cigarettes a day). Greatly increased risk of stroke and heart attack if the smoker is aged over 35 years and taking the oral contraceptive pill. Paternal smoking can also harm the fetus if the non-smoking mother is exposed to second-hand smoke. If a parent continues to smoke during their baby’s first year of life, the child has an increased risk of ear infections, respiratory illnesses such as pneumonia and bronchitis, sudden infant death syndrome (SIDS) and meningococcal disease. Poor blood circulation in feet and hands, which can lead to pain and, in severe cases, gangrene and amputation. Therefore, man thinks that he smokes a cigarette, but in reality, the cigarettes are smoking him dead.